foothillryder | Biker for life …. Sami is here, and already in the movies! Sami Sprint’s first movie! from FoothillRyder on Vimeo. November 2013 – Samantha is on the way! In a final change to the ‘Triple Triple’ stable, I found the bike I’d been looking for the past ten years – a first generation Triumph Sprint. It was on eBay; but didn’t sell because the bidding didn’t reach the reserve, so I sent the seller a message, then we spoke on the phone. He knew what he had, and I wanted it. His price was not out of my expectations for a Sprint this vintage (’96), color (British Racing Green), and condition (he’d owned it since new and maintained it meticulously). We made a deal and Samantha (‘Sami’) headed west. I could not be more pleased. 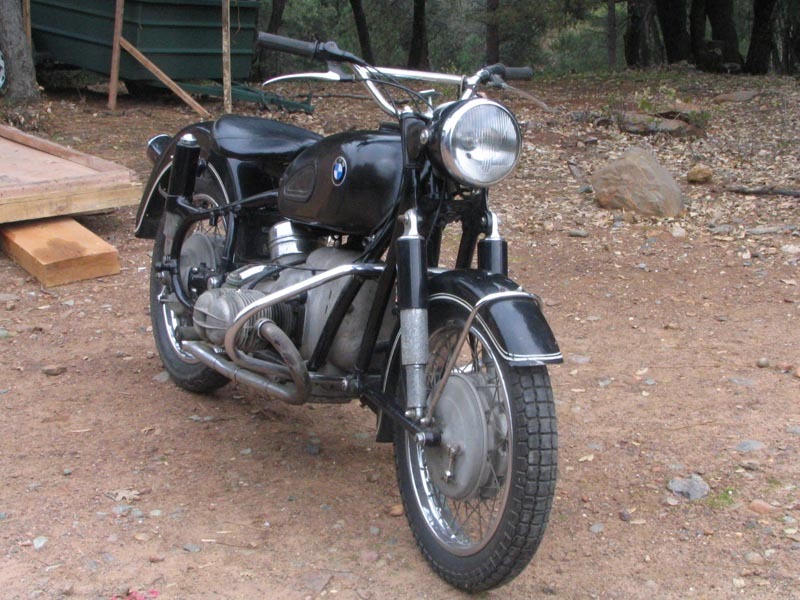 Mantissa was easy to sell, and went to a young ‘Type A’ lad who had a Bimota stolen a while back. She’ll be well cared for and ridden as she should be. April 2013 – Gettin’ out and about! 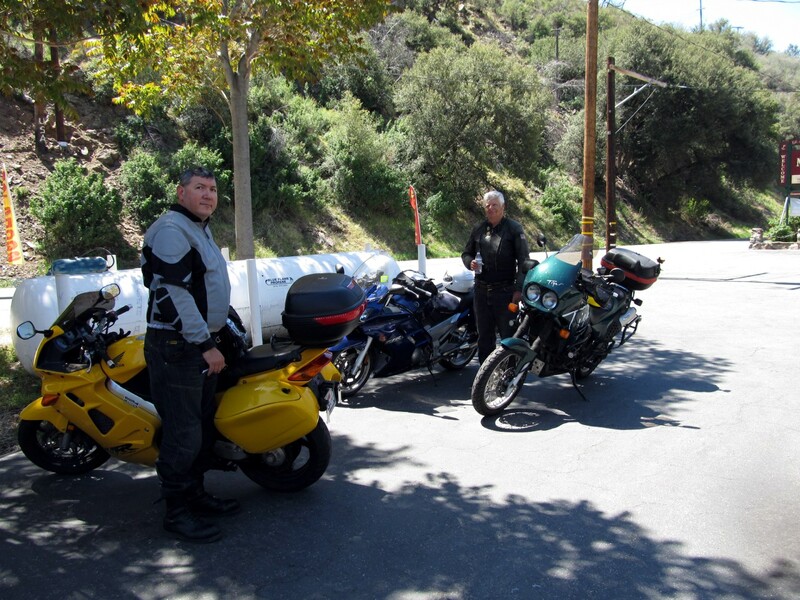 With the weather warming up nicely, Simba and I headed down the big valley to hookup with fellow ‘Maggot’ (SabMag listmembers) Dave Q and Halfway Harry to check out some of the roads around Kernville, CA in preparation for Harry’s June event. I rode down the day before and was offered very gracious hospitality by one of the SabMag ladies in the form of a room, and Dave Q’s wonderful family provided fantastic meals too. Simba at rest after a nice ride down the ‘spine’ of California. Dave Q was there when I arrived, and his lovely wife and one of his daughters, as well as a family friend and her daughter joined us for a great meal of Chile Verde, Beans, Rice, and fresh Corn on the cob. The following morning Dave and I headed out pretty early to hookup with his friend Sheldon, who would accompany us up to the Saddlesore Saloon in Glenville. 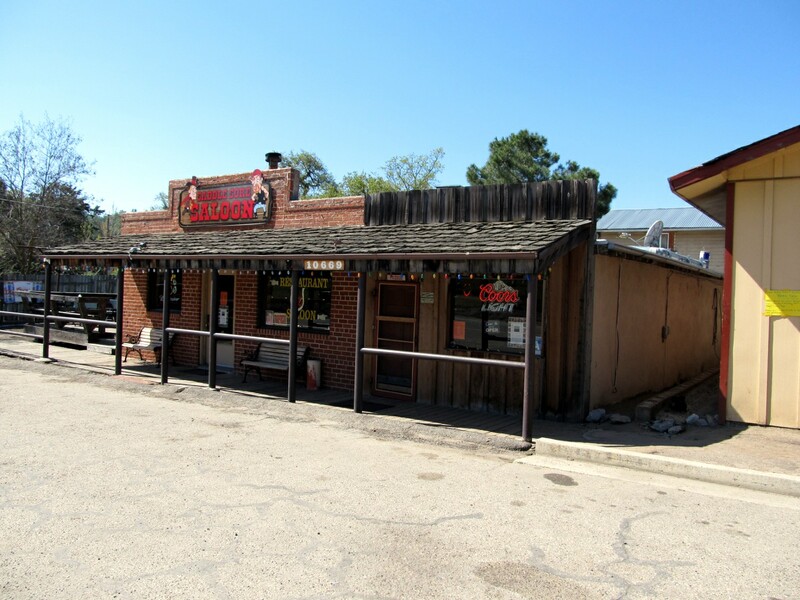 The Saddlesore Saloon had darn good breakfast fare for a bar! Dave Q and Halfway Harry (and Simba, of course) at a brief stop to chat about the closed road and our options. I actually did shoot some video (forward only, with the Contour); but shortly after the ride began some large insect splattered on the camera lens, so none of the video was really useable. I’ll shoot more in June! March 2013 – Something a little different! If you checked out the post just below this one (and watched the video), then perhaps you noticed I’m doing my own background music for my ride videos. I’m also doing other music, and you can check it all out on SoundCloud. March 2013 – Spring is coming! It’s been quite cold, and on occasion somewhat damp, for what seems like months. While this condition lends itself to getting things done inside, it isn’t great for riding motorcycles. So here’s a little video I put together to warm the riding heart while we wait for weather more conducive to actual riding. Okay, so if you’ve been following along you’ve seen several bikes come and go over the past two years or so. 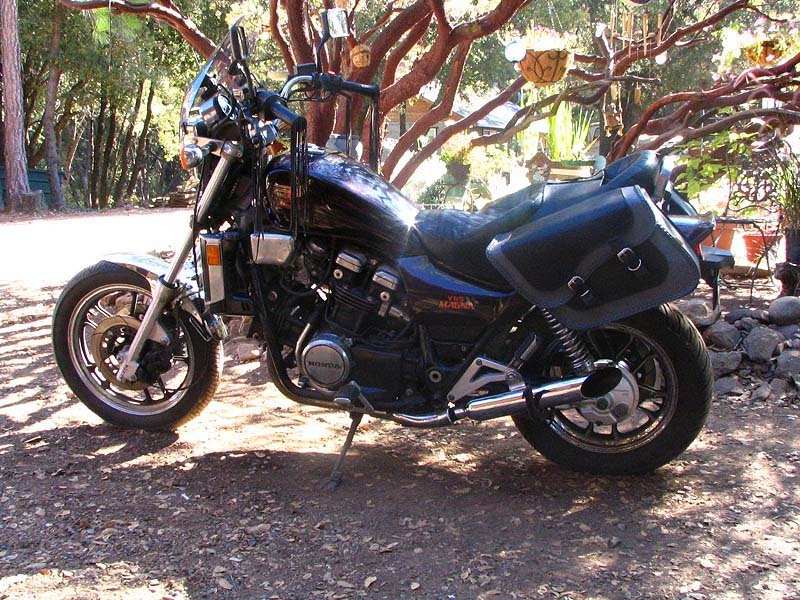 After the downsize in 2009-2010 I had to wait until things stabilized for us, then began my quest for the ‘perfect stable of bikes’ to pursue the riding I wanted to do. ‘Buffy’ the Triumph Scrambler came first, shortly followed by ‘Vikki’ the Honda VF1000R. Vikki was the first to go, as after doing enough work to make her rideable it was apparent that her heft and ‘racer crouch’ riding position weren’t what suited me for a ‘sporty’ bike. 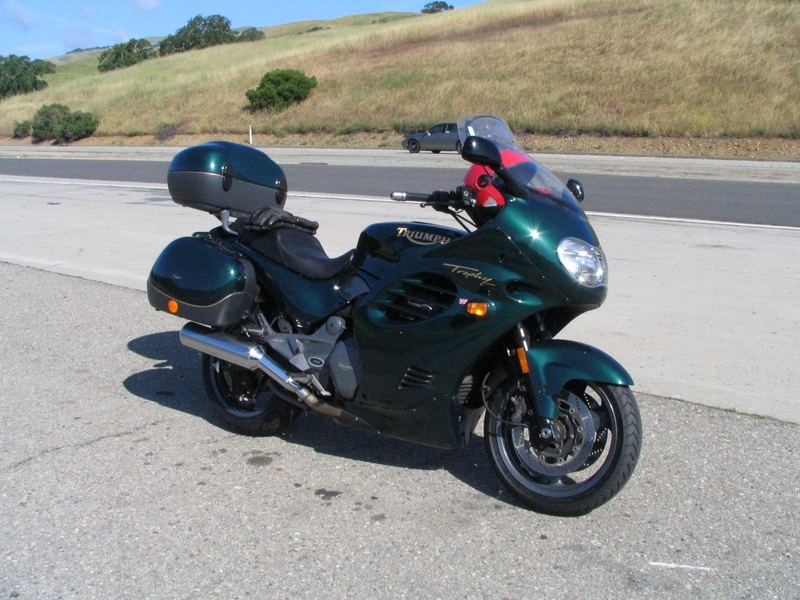 Shortly after that transaction I picked up ‘Valerie’, the Honda VFR with all the right upgrades. 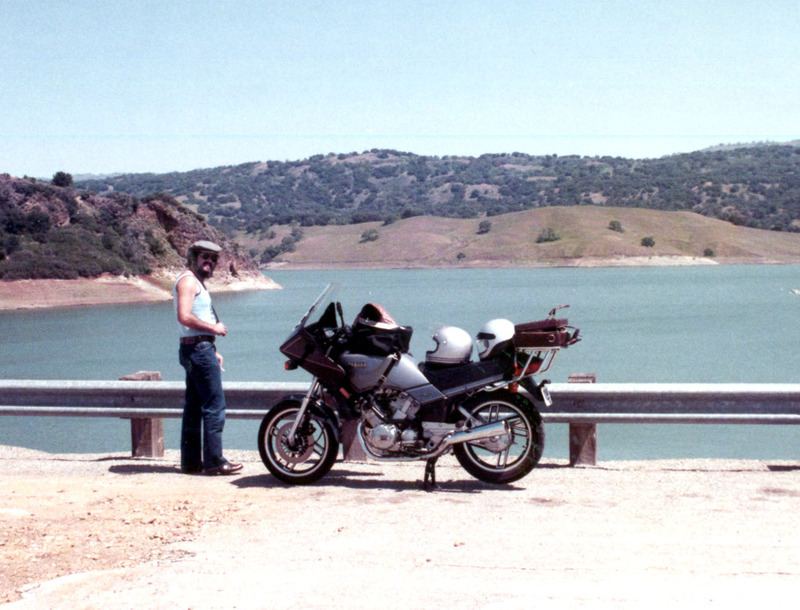 Then I took a 3000 mile trip on Buffy and discovered three things that made her unsuitable for such a ride. To be brief, she had inadequate fuel range, she didn’t handle a full load well, and she was underpowered – especially at higher elevations. 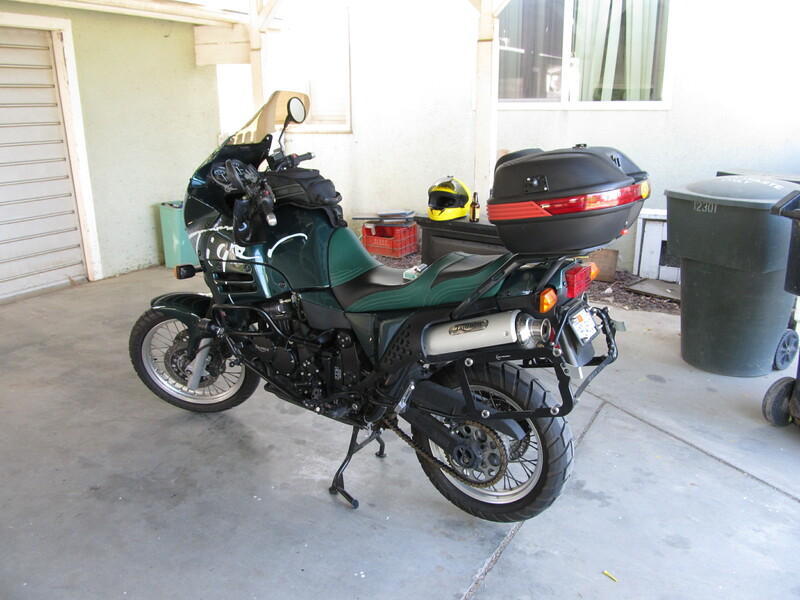 I posted an ad on ADV, wanting to either trade the Scram for a Triumph Tiger or sell her outright. Within a few hours I had a buyer for Buffy, and she was picked up the following day to be delivered to her new owner. Then I got a PM from a gent in North Dakota who had this ‘Steamer’ – the first generation Triumph Tiger (and the one I wanted) – for sale. 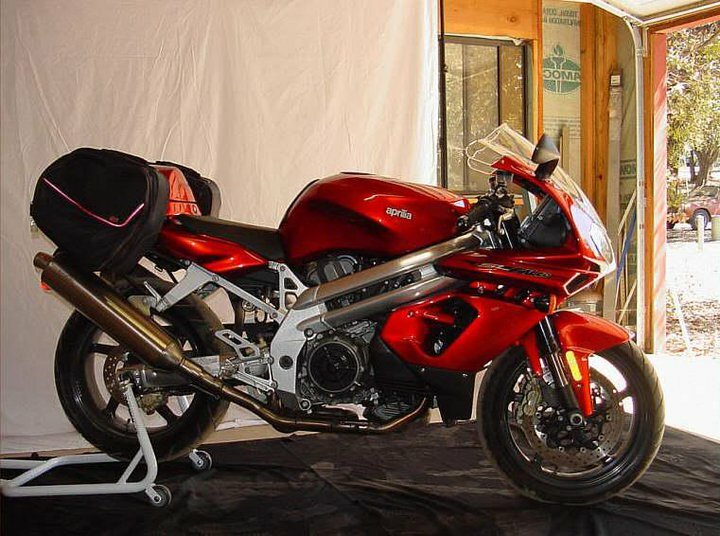 All the right accessories, new tires, a clean bill of health from the Triumph dealer, and the right price. Done. ‘Simba’ was purchased and a few weeks later she was in my hands. 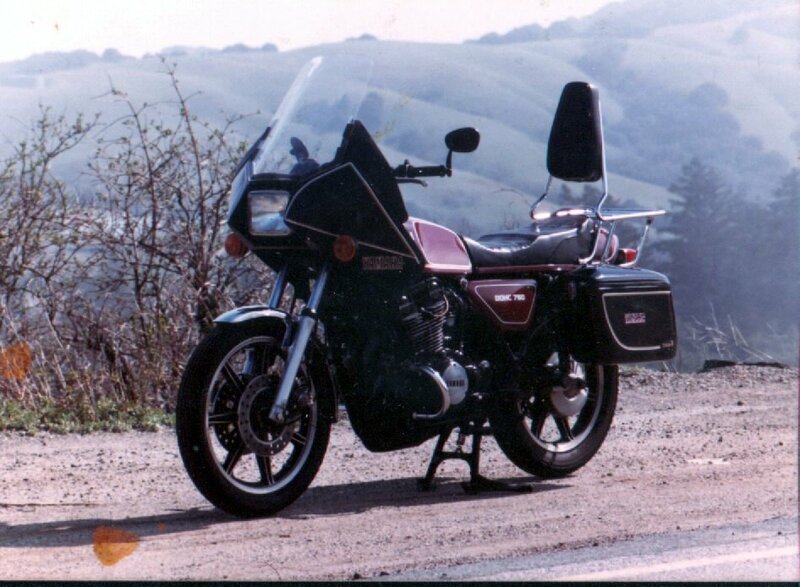 In the first month I owned Simba I put nearly 2000 miles on the bike. Superbly comfortable and long-range capable, she was the perfect replacement for Buffy and had none of the flaws. I took Val out on some shorter jaunts and came to the realization that she wouldn’t be getting much – if any – seat time. Even Val’s somewhat ‘relaxed’ crouch just wasn’t comfortable enough for my aging frame. Although I began with ads on a couple of the Honda forums and even an eBay auction, what finally did the trick was an ad on my ‘local’ Craigslist. A young gent was looking for precisely this bike, and she was gone in a day. Within a few hours of placing the ‘WTB’ post on the ADV forum I was contacted by my new friend Rick. He actually had not yet decided to sell the bike; but when he read my post he knew I was her next owner. He sent pics, we spoke on the phone, a deal was made and in less than two weeks ‘Mantissa’ had made her way from New Jersey to California to join Katrina and Simba in my stable. 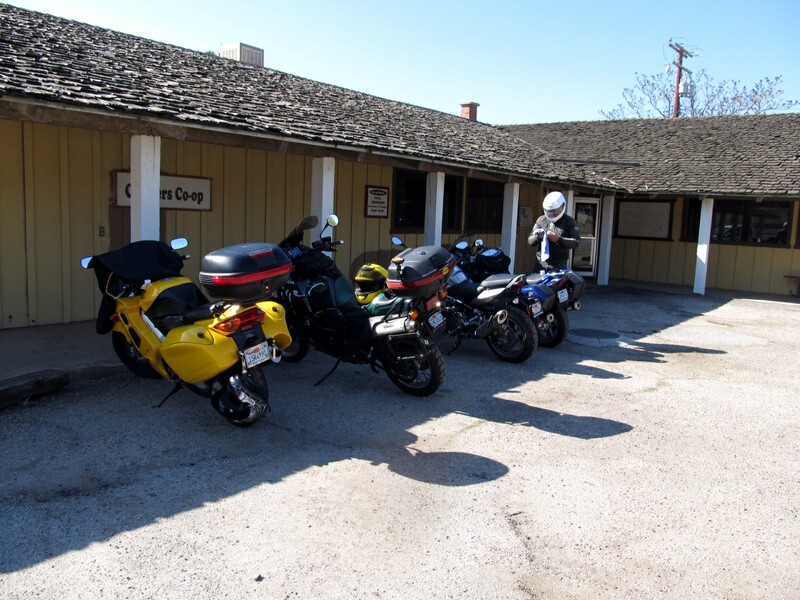 So there you have it – the story behind the FoothillRyder stable – Triple Triple Threat (all three of my bikes are powered by that sweet Triumph 3-cylinder engine). Enjoy! 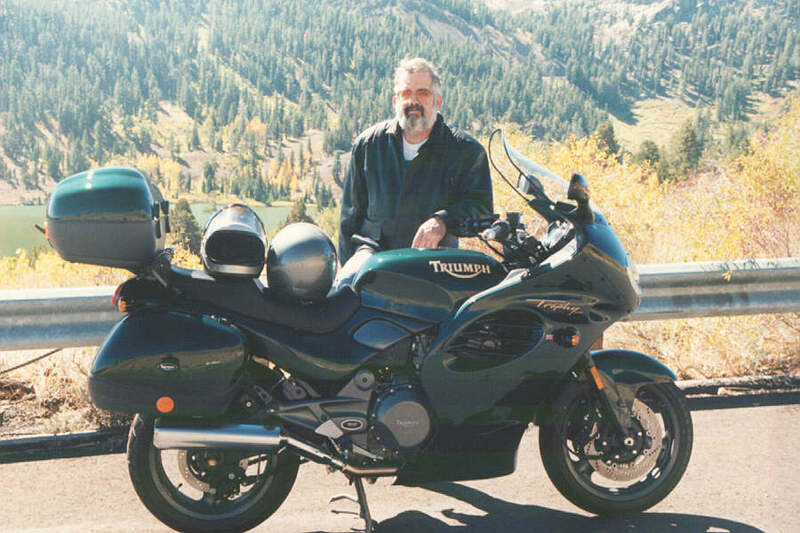 Back in my teen years I liked bikes and had several friends who rode; but my first passion was sports cars. British sports cars, to be more specific. Although my first ‘car’ was an English Ford Anglia, bought for forty bucks and used as a dirt practice vehicle (!! ), the first car I used as transportation was a 1958 Austin Healy 100-6 in brilliant gloss black with a white leather interior. I loved this car, and wish I had pictures to share as it took me on many adventures as a young lad. It was the first of several Healy’s, with a Triumph TR-3 thrown in the middle. But motorcycling was lurking in the background, and with a separation from my first wife I saw the opening and took it. A coworker talked me into selling the Vision to him, and for two years I was miserable without a two-wheeled motivator to keep me happy. Planning a brief semi-retirement and a move from Gilroy up to Pine Grove, I went down to the local Honda shop and found my next bike. 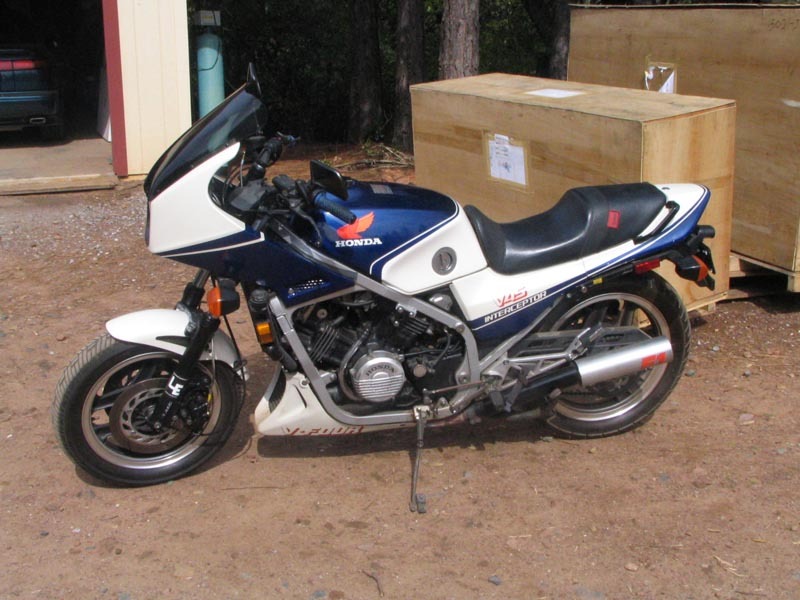 She’s a 1985 Honda VF1100S, also known as the V65 Sabre. Equipped with the coveted Hondaline sport fairing when I bought her, I added only a Corbin seat with backrest to make her ready for my roads and used soft luggage when I needed to carry things. The big V-4 punched out a solid 121 horsies (at the crank, so ~105 at the wheel), and was smooth as glass. It was also very comfortable as an all-day riding partner. 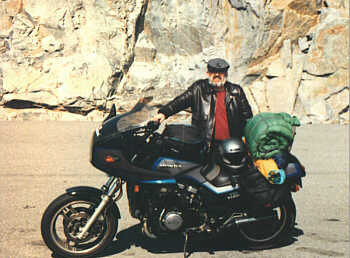 Here is a pic of Sadie with me on a motorcycle camping outing, this one taken at 8000 feet on Carson Pass circa 1996. … and another of the beautiful Triumph with better lighting. There have been others; but you get the idea. 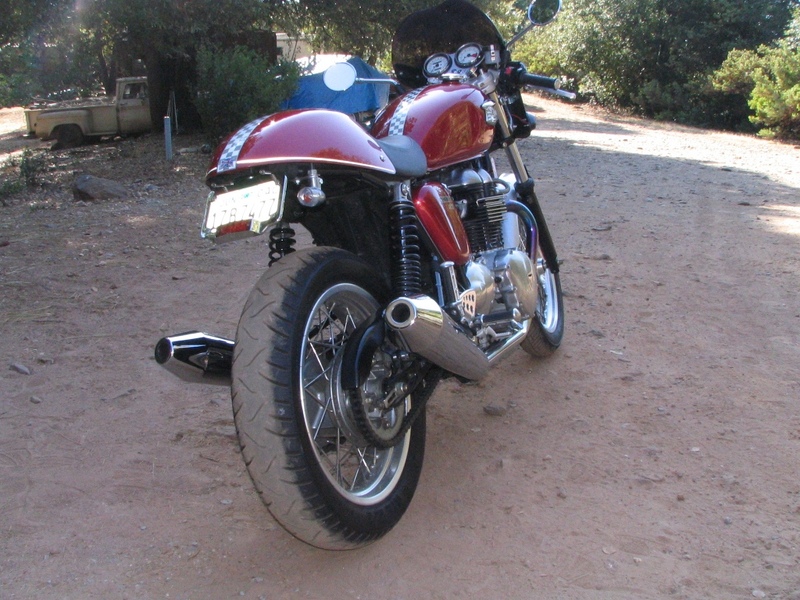 I’ve owned some cool toys, and still have Katrina, Buffy (the Scrambler/Tiger Cub), VroomHilde, and the ’73 Bonneville. Here’s to motorcycles and the people who ride them! October 17,2012 – Mantissa makes a movie!